While Redwood Ed focuses on the coast redwoods, much of the natural history background in Section I, and many of the lessons in Section IV, would be useful in studies of other types of forest ecosystems. Redwood Ed is written for teachers, docents, parents, youth group leaders, naturalists, and anybody else who wants a comprehensive guide to the coast redwood forests and parks. It is intended to provide information in a format that is easy to use and understand, rather than an in-depth scientific study of the redwood region and parks. Redwood Ed is useful throughout the redwood region, from southern Oregon to Big Sur. 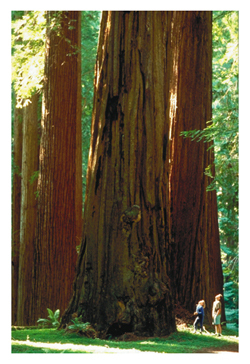 The focus of Redwood Ed is on the coast redwood, Sequoia sempervirens. Following a thorough Introduction, Section I provides background scientific information, including a review of basic scientific and ecological principles, and descriptions of some of the more common or important organisms of the redwood forest. Section II deals with the human history of the redwoods, from the early Native Americans to modern times. Because this section has many graphics, we've broken it down into three PDF files for ease of downloading: Chapters 1 to 3, Chapters 4 and 5, and Chapters 6 to 9. Section III explains how to plan and execute a field trip to a redwood park. Section IV provides lessons and activities that can be done before, during, and after a trip to the redwood parks. Most of the activities and lessons could be used in other forest types, or even non-forest ecosystems. Users are encouraged to skim all sections, focusing on areas where their background is not so complete. Use as much or as little as suits your needs! For your convenience, some information is repeated in different sections. And don't forget about the Appendices.